Andersen Air Force Base (Andersen AFB, AAFB) (IATA: UAM, ICAO: PGUA, FAA LID: UAM) is a United States Air Force base located approximately 4 miles (6.4 km) northeast of Yigo near Agafo Gumas in the United States territory of Guam. 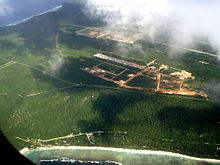 Along with Naval Base Guam, Andersen AFB was placed under the command of Joint Region Marianas on 1 October 2009. The two bases are about 30 miles apart at opposite ends of the island. Administration offices for Joint Region Marianas are about half-way in between, at Nimitz Hill. The host unit at Andersen AFB is the 36th Wing (36 WG), assigned to the Pacific Air Forces Eleventh Air Force. A non-flying wing, the 36 WG's mission is to provide support to deployed air and space forces of USAF and foreign air forces to Andersen, and to support tenant units assigned to the base. Andersen AFB was established in 1944 as North Field and is named for Brigadier General James Roy Andersen (1904–1945). The 36th Wing Commander is Brig. Gen. Gentry W. Boswell. The Vice Wing Commander is Colonel Matthew J. Nicholson and the Command Chief Master Sergeant is Chief Master Sergeant Gary R. Szekely. The most important U.S. air base west of Hawaii, Andersen is the only one in the Western Pacific that can permanently base U.S. heavy strategic bombers (one of the four Air Force Bomber Forward Operating Locations), including B-1B, B-2, and B-52 bombers. It is one of two critical US bases in the Asia Pacific region, along with Diego Garcia in the Indian Ocean. Andersen is one of four bomber forward operating locations of the US Air Force. These locations provide forward support to bomber crews deploying overseas in Europe, Southwest Asia and in the Pacific. The Air Force is establishing forward-deployed bomber beddown support at key locations throughout the world and Andersen is one of two critical bases in the Asia-Pacific region. The other location is Diego Garcia in the Indian Ocean. Guam's almost unrestricted airspace and the close proximity of the Farallon de Medinilla Island, a naval bombing range 184 miles (296 km) north, makes this an ideal training environment. Andersen Air Force Base was established on 3 December 1944 and is named for Brigadier General James Roy Andersen (1904–1945). General Andersen graduated from the United States Military Academy in 1926, served at various army installations, and obtained his wings at Kelly Field, Texas, in 1936. During 1943–1944 he served on the War Department General Staff. In January 1945, General Andersen was assigned to HQ AAF, Pacific Ocean Area. He died on 26 February 1945 in the crash of a B-24 Liberator aircraft between Kwajalein and Johnston Island while en route to Hawaii. Andersen Air Force Base's origins begin on 7 December 1941 when Guam was attacked by the armed forces of Imperial Japan in the Battle of Guam (1941) three hours after the Attack on Pearl Harbor. The United States Navy surrendered Guam to the Japanese on 10 December. At the height of the war, approximately 19,000 Japanese soldiers and sailors were deployed to the island. Guam was liberated by the United States Marine Corps' 3rd Amphibious Corps on 21 July 1944, in the Battle of Guam (1944), after a 13-day pre-invasion bombardment. The Japanese managed to contain the Marines on two beachheads, but their counter-attack failed. The Marines renewed their assault, and reached the northern tip of the island on 10 August 1944. Japanese guerrilla activities continued until the end of the war, and some even were holdouts for many years afterwards. Guam was considered as being ideal to establish air bases to launch B-29 Superfortress operations against the Japanese Home Islands. The Marianas Islands are about 1,500 miles (2,400 km) from Tokyo, a range which the B-29s could just about manage. Most important of all, it could be put on a direct supply line from the United States by ship. "North Field", as Andersen AFB was first named, was the first air base built on Guam after its liberation, being constructed by United States Navy Seabees beginning in November 1944. 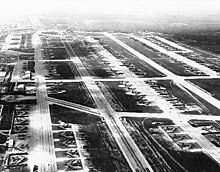 North Field and its co-located Northwest Field, was a massive installation, with four main runways, taxiways, revetments for over 200 B-29s, and a large containment area for base operations and personnel. The first host unit at North Field was the 314th Bombardment Wing, XXI Bomber Command, Twentieth Air Force. The 314th arrived on Guam on 16 January 1945 from Peterson Field, Colorado. The 314th controlled four operational B-29 bomb groups, the 19th, (Square M), 29th (Square O), 39th (Square P), and 330th (Square K). B-29 Superfortress missions from North Field were attacks against strategic targets in Japan, initially operating in daylight and at high altitude to bomb factories, refineries, and other objectives. Beginning in March 1945, the XXI Bomber Command changed tactics and started carrying out low-level night incendiary raids on area targets. During the Allied assault on Okinawa, groups of the 314th Bomb Wing attacked airfields from which the Japanese were sending out suicide planes against the invasion force. Flying out of Guam, S/Sgt Henry E Erwin of the 29th Bombardment Group was awarded the Medal of Honor for action that saved his B-29 during a mission over Koriyama, Japan, on 12 April 1945. When a phosphorus smoke bomb exploded in the launching chute and shot back into the plane, Sgt Erwin picked up the burning bomb, carried it to a window, and threw it out. After the war, B-29s from North Field dropped food and supplies to Allied prisoners and participated in several show-of-force missions over Japan. The 29th, 39th and 330th Bomb Groups returned to the United States and inactivated in December 1945 while the 19th remained on Guam to become the host unit at the station when the 314th Bomb Wing was reassigned to Johnson AB, Japan for occupation duty. After the end of World War II, Guam served as a collection point for surplus war goods that had accumulated in the Pacific Theater. The 19th Bombardment Wing was formed at North AFB in 1948 from the resources of the former North Guam Air Force Base Command (Provisional). The 19th BW, with the 19th Bomb group as its operational flying unit, operated Andersen AFB and maintained proficiency in B-29s. In May 1949, headquarters Twentieth Air Force moved from Guam to Kadena AB, Okinawa and its former staff was assigned to the 19th Bomb Wing. At Andersen, the wing assumed responsibility for administering two active and one semi-active bases plus an assortment of communication, weather, radar, rescue and other facilities and units including the Marianas Air Material Area, a wing size unit. Many of the units and facilities were inactivated within a few months. In October 1949, the 19th Wing again became subordinated to the 20th Air Force and the remaining units in the Marianas and Bonin Islands were transferred to other organizations. From 17 October 1949 until 28 June 1950, the wing continued B-29 training, operation of Andersen Air Force Base and some rescue and reconnaissance missions. Three days after North Korea invaded South Korea in 1950, the 19th Bomb Group deployed B-29s to Andersen to begin bombing targets throughout South Korea. A few days later, the group was detached from the 19th Bomb Wing and deployed to Kadena Air Base on Okinawa Island, Japan, though the rest of the wing stayed at Andersen and provided maintenance for transient aircraft and operated ammunition dumps until 1953. In 1951, the Strategic Air Command (SAC) chose several overseas bases to support rotational unit deployments of its bombers from stateside bases, starting with B-29 Superfortress units and later including Convair B-36, B-47 Stratojet, B-50 Superfortress bombers, and KB-29 refueling tankers. With hostilities in Korea at a standstill, the 19th Bomb Wing headquarters relocated to Kadena Air Base, Japan in 1953, and was replaced by the 6319th Air Base Wing of the Far East Air Forces (FEAF). However, the FEAF Bomber Command (FEAF's 19th Bomb Wing and SAC's 98th and 307th Bomb Wings) was inactivated in 1954 and its three B-29 wings returned stateside and replaced with B-47s. The 3rd Air Division was activated on 18 June in its place, its object being control of all SAC units in the Far East. The division operated as a tenant unit from June 1954 until April 1955, and received host-base support services from the 6319th until that unit was inactivated on 1 April 1955. The 6319th was replaced with the SAC-aligned 3960th Air Base Wing. The Strategic Air Command continued its 90-day unit rotational training program, and began to take over control over the base from the FEAF. After the 1 April 1955 base transfer and activation of the 3960th Air Base Wing, B-47s replaced the B-36s in the rotations, and the 43rd Bomb Wing from Davis-Monthan Air Force Base, Arizona, operated from July to October 1957 (it eventually became the host unit at Andersen). The 3960th Air Base Wing was redesignated on 1 July 1956 as the 3960th Air Base Group. Additionally, the 41st Fighter-Interceptor Squadron of the Pacific Air Forces, along with its F-86s, was stationed at Andersen from August 1956 until it was inactivated in March 1960. After that, the air defense mission was provided by deployments of 5th and 13th Air Force units flying the F-102 aircraft. Andersen saw an end to its role in rotational duties when the B-47 was phased out and replaced by the B-52 Stratofortress. The first B-52, the "City of El Paso", arrived from the 95th Bomb Wing at Biggs Air Force Base, Texas, in March 1964, followed by KC-135 Stratotankers. With the start of Operation Arc Light in June 1965, B-52Fs and KC-135As began regular bombing missions over Vietnam, and continued in that capacity until 1973, with a break between August 1970 and early 1972. In support of Operation Arc Light, SAC activated the 4133rd Bombardment Wing (Provisional) on 1 February 1966, though the 3960th Strategic Wing, originally activated in 1955 as the 3960th Air Base Wing, continued as the base's host wing until it was inactivated and replaced by the 43rd Strategic Wing on 1 April 1970. The 43rd assumed the mission of the 4133rd on 1 July 1970, and continued in this capacity until the 57th Air Division (Provisional) and 72nd Strategic Wing (Provisional) were activated in June 1972 in support of Operation Bullet Shot (military operation name for temporary duty assignment of US-based technicians — "the herd shot 'round the world".) The 303rd Consolidated Aircraft Maintenance Wing (Provisional) was activated a month later in July. All of the provisional units remained at Andersen until bombing missions ceased on 15 November 1973. Operation Linebacker II continued the mission of Operation Arc Light, and was most notable for its 11-day bombing campaign between 18 and 29 December 1972, in which more than 150 B-52 bombers flew 729 sorties in 11 days. The B-52s at Andersen, combined with other bombers stationed at U-Tapao Field in Thailand, constituted about 50 percent of SAC's total bomber force and 75 percent of all combat crews. Essentially, two bases contained the equivalent of 13 stateside bomber wings. The frequent bombings resulted in a cease-fire in Vietnam, but the B-52s continued to fly missions over Cambodia and Laos until those were halted on 15 August 1973. With the end of these runs, more than 100 B-52s, both D and G Models, were redeployed elsewhere in the world by October 1973. The Eighth Air Force moved to Barksdale Air Force Base, Louisiana, and the 3rd Air Division was reactivated on 1 January 1975. When the Communist forces overran South Vietnam later in 1975, the base provided emergency relief and shelter for thousands of Vietnamese evacuees as a part of Operation New Life. After the fall of Saigon, Andersen received almost 40,000 refugees and processed another 109,000 for onward transportation to the United States. The base returned to routine operations by the late 1970s, but continued to serve as one of SAC's strategic locations. Crews and aircraft were regularly sent to sites between Australia, Alaska, and Korea, and supported sea surveillance operations support for the U.S. Navy. Andersen was also home to the 54th Weather Reconnaissance Squadron "Typhoon Chasers" during the 1960s through the 1980s. Aircrews flying WC-130s tracked and penetrated typhoons giving advanced warnings to military and civilian populations throughout the western Pacific. During the Vietnam War, the 54th also provided cloud-seeding capability along the Ho Chi Minh Trail and synoptic reconnaissance, deploying from Udorn RTAFB when not at Guam. The 54th WRS was inactivated in September 1987. In 1983, the 43rd completed its transition from the B-52D to the B-52G, and thus became one of only two SAC bomber wings equipped with the Harpoon anti-ship missile. The base saw a major change in 1989, when control transferred from the Strategic Air Command to Pacific Air Forces. The 633rd Air Base Wing activated on 1 October 1989, which led to the inactivations of the 43rd Bomb Wing on 26 March 1990, and the 60th Bombardment Squadron (Heavy) on 30 April 1990. In August 1990, Andersen personnel began shipping over 37,000 tons of munitions to forces in the Persian Gulf in support of Operations Desert Shield and Desert Storm. With the eruption of Mount Pinatubo in June 1991, Andersen was instrumental in caring for American evacuees and their pets as a part of Operation Fiery Vigil. In December, Andersen became home to the Thirteenth Air Force, which had evacuated from Clark Air Base in the Philippines after the eruption. The host unit changed again on 1 October 1994, when the 633rd Air Base Wing was inactivated. The 36th Air Base Wing took over host operations, and was redesignated as the 36th Wing on 12 April 2006. In October 1994, the U.S. Navy's Helicopter Combat Support Squadron Five (HC-5) relocated to Andersen from the now closed Naval Air Station Agana, Guam. HC-5 was later redesignated as Helicopter Sea Combat Squadron Twenty-Five (HSC-25) following its transition from the CH-46 to the MH-60S. The base was one of the few places in the world where the NASA Space Shuttle was permitted to land, serving as an Augmented Emergency Landing Site for the Shuttle orbiter. On 23 February 2008, a USAF B-2 Spirit stealth bomber, one of the most expensive military aircraft in the world, crashed on the base. Both pilots ejected safely before the plane, valued at US$1.4 billion, crashed moments after take-off due to a mechanical failure. This was the first time a B-2 had crashed. On 21 July 2008, a US B-52 Stratofortress crashed into the sea while on a training mission that was to include a flyover during a parade in Guam remembering the U.S. liberation of the island from Japanese occupation in 1944. B-2s from the 13th Bomb Squadron and 393d Bomb Squadron have taken turns with B-52 aircraft to provide a continuous bomber presence at the base. 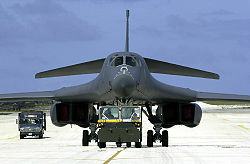 One such four-month deployment by four B-2s began in March 2009. In March 2009, the base announced that it would look into allegations by a whistleblower of environmental violations within the protected area of the base. The allegations include poaching, illegal trapping of coconut crabs and resale of trophy deer, and paving beaches and stripping vegetation used for nesting by endangered hawksbill turtles and green sea turtles. Public Employees for Environmental Responsibility (PEER) stated that, "The Air Force program for protecting Guam's natural resources has utterly broken down." The Department of Defense Inspector General (DOD IG) determined that the Air Force responses to the PEER allegations adequately addressed the issues raised. Consequently, DoD IG determined further investigation was not warranted. The strategic importance of Andersen AFB was brought to the fore on Tuesday, 12 February 2013 when the base was circled by two Russian Tupolev Tu-95 Bear-H bombers, mere hours prior to President Obama's State of the Union Address. Their flight was monitored by US F-15 fighter jets and eventually the Russian bombers left the area in a northbound direction. As tensions escalate between the US and the North-Korean regime, the latter threaten to strike the island. A total of 816,393 munitions assets valued at over $95 million dollars were delivered to Andersen Air Force Base between August 21 and September 30, 2017. Task Force Talon - US Army, E Battery, 3rd Air Defense Artillery Regiment THAAD and support elements. Andersen Air Force Base is home to Andersen Elementary School and Andersen Middle School. High school students attend Guam High School in Asan, Guam. Higher educational opportunities for those in the military and working for the Department of Defense, as well as for family members at Andersen are available through contracted academic institutions such as The Asian Division of University of Maryland University College (UMUC) and The Pacific Far East Division of Central Texas College. Andersen Middle School caters to a population of 6th to 8th graders from American military families. The school is under the Department of Defense Education Activity school system, and under the subsystem DDESS Guam. It has a 5-year accreditation obtained from the North Central Association of Colleges and Schools. In September 1997 the DoDEA opened its own schools for children of military personnel. They have Volleyball, Cross Country, Softball, Soccer, Basketball, and more. Andersen Middle School was founded in 1997, and was scattered across Andersen Air Force Base. Classes for the original school were held in former Air Force dormitories, with many of the rooms having walls knocked out in order to enlarge the rooms. The original library for the elementary school was shared with the base library for its first year. As of 2012, it is now permanently located in an air conditioned building. Andersen Middle School has adopted the block scheduling system. The school has divided classes between two days: Blue day and Silver day. Blue day consists periods 1–4, and Silver day consists of periods 5–8. They also switch out the rotation order of periods. The school decided they would have something called rotation A, B, C, and D. Each rotation has a different order of the way the periods are switched out. for periods on a blue day Rotation A is considered 1st, 2nd, lunch, 3rd and then 4th. rotation B is 2nd, 3rd, lunch, 4th, and 1st. rotation c is 3rd, 4th, lunch, 1st and then 2nd. rotation D is 4th, 1st, lunch, 2nd, and then 3rd. for periods on a silver day the rotations are like this: A=5, 6, lunch, 7, 8. B=6, 7, lunch 8, 5. C=7, 8, lunch, 5, 6. and D= 8, 5, lunch, 6, and 7. The core classes are physical education, mathematics, science, social studies, reading, and language arts. The elective classes include Spanish, band, study skills, video production, culture and drama. The school also offers a special education program, as well as opportunities to take advanced courses from high school such as algebra and geometry. ^ "Andersen Air Force Base web page". Andersen.af.mil. Archived from the original on 27 March 2014. Retrieved 25 April 2014. ^ a b "History of Joint Region Marianas". Cnic.navy.mil. Archived from the original on 17 October 2012. Retrieved 25 April 2014. ^ "Biographies". www.andersen.af.mil. Archived from the original on 18 August 2016. Retrieved 21 July 2016. ^ a b Pike, John. "Andersen AFB". globalsecurity.org. Archived from the original on 24 September 2017. Retrieved 7 May 2018. ^ "Why Is North Korea So Fixated on Guam?". popularmechanics.com. 9 August 2017. Archived from the original on 24 September 2017. Retrieved 24 September 2017. ^ a b John Pike. "''Andersen AFB''". GlobalSecurity.org. Archived from the original on 8 July 2014. Retrieved 25 April 2014. ^ "Operation Bullet Shot". GlobalSecurity.org. Archived from the original on 4 December 2011. Retrieved 23 July 2011. ^ John Pike (20 July 2011). "Space Shuttle Emergency Landing Sites". Globalsecurity.org. Archived from the original on 31 March 2016. Retrieved 25 April 2014. ^ US stealth bomber crashes on Guam Archived 25 February 2008 at the Wayback Machine, BBC News. Retrieved 23 February 2008. ^ Dumat-ol Daleno, Gaynor, "Stealth Bombers to Deploy to Guam", Pacific Daily News, 27 February 2009. ^ Pacific Daily News, "Andersen To Review Alleged Environmental Violations", 7 March 2009. ^ Gertz, Bill "Archived copy". Archived from the original on 18 February 2013. Retrieved 20 February 2013. CS1 maint: Archived copy as title (link)The Washington Free Beacon, retrieved 15 February 2013 "Bear Bombers over Guam"
^ CNN, Zachary Cohen and Euan McKirdy,. "North Korea threatens strike on Guam". cnn.com. Archived from the original on 25 September 2017. Retrieved 24 September 2017. ^ Pickrell, Ryan. "U.S. Sends Hundreds Of Thousands Of Bombs To Guam As North Korea Threat Looms". The National Interest. Archived from the original on 26 November 2017. Retrieved 7 May 2018. ^ a b "AF Historical Research Agency: ''19 AIR REFUELING GROUP (AMC)''". Afhra.af.mil. Archived from the original on 20 September 2011. Retrieved 25 April 2014. ^ "University of Maryland University College Asia - UMUC Asia". Asia.umuc.edu. Archived from the original on 27 February 2014. Retrieved 25 April 2014. ^ "Pacific Far East - Central Texas College". Pfec.ctcd.edu. 18 July 2013. Archived from the original on 2 March 2014. Retrieved 25 April 2014. ^ "Guam School to Be Renamed in Honor of NASA Astronaut William McCool". This article incorporates public domain material from the United States Government document "Andersen Air Force Base". Maurer, Maurer. Air Force Combat Units Of World War II. Washington, D.C.: U.S. Government Printing Office 1961 (republished 1983, Office of Air Force History, ISBN 0-912799-02-1). Fletcher, Harry R. (1989). Air Force Bases Volume II, Active Air Force Bases outside the United States of America on 17 September 1982. Maxwell AFB, Alabama: Office of Air Force History. ISBN 0-912799-53-6. Wikimedia Commons has media related to Andersen Air Force Base. "Arc Light Memorial" and "Combat Skyspot Memorial"